Hawthorn leaf spot or Entomosporium mespili is the most common fungus disease for Hawthorn trees in Calgary. 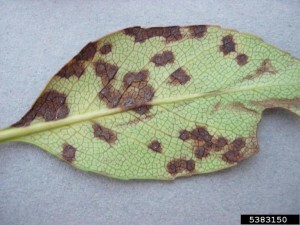 The English (paulii) variety is especially prone to the disease and is therefore not recommended for planting in Calgary. Alternative more resistant varieties are available that grow well in Calgary. 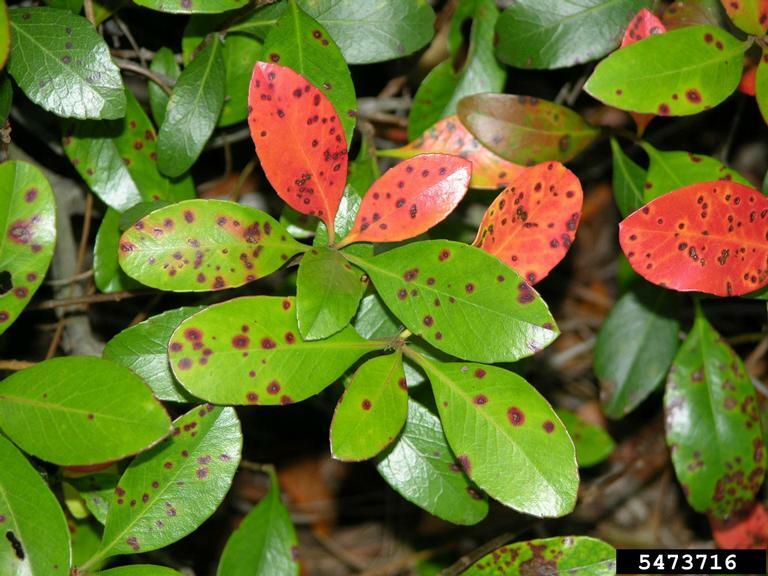 In the early stages of the disease red/purple spots can be observed on the leaves, new growth and fruits, which turn into purple/gray/brown blotches in later stages. End result leads to yellowing of the leaves and premature leaf drop. Infestation occurs through wind and rain dispersal in the early spring from leaf litter and infested twigs. Which of my trees should be inspected for Hawthorn leaf spot? Hawthorn leaf spot can affect most varieties in the Hawthorn family. As said some varieties are very prone to get infected while others are affected in much lesser extent. Is my tree infected with Hawthorn leaf spot? Development of red/purple spots on leaves, twigs and fruits. Diminishing fruit and flower production. Following pictures can help you determine if your tree is infected with Hawthorn leaf spot. Can Hawthorn leaf spot be treated? There are several measures that will help to control Hawthorn leaf spot. Collection of fallen leaf litter around the trees. Pruning of the infested twigs. Hawthorn leaf spot can be controlled by a wide variety of organic and non-organic chemicals, although success rates differ significantly between the chemicals used. In recent years one of the biggest companies involved with the development and production of tree medication has created an application specially developed for this disease. Applications should be done early in the year for optimum effect and minimal impact on birdlife and the environment. Is my tree is infected?